Charles Hugh Smith questions the whether gold is the best way to store wealth in the coming "Great Transformation", when oil becomes very scarce. (I remember how valuable gasoline was in the movie Mad Max 2: The Road Warrior). He suggests that having a convenient supply of energy and food are the most valuable sources of wealth in very hard times. Excerpts below. Link: Of two minds: The Great Transformation: Trends and Cycles of History. If we understand that "money" as a store of wealth is simply stored energy, then we reach another understanding of "the problem" and thus of the "solution." The reason is "money" as a store of wealth is simply stored energy. From this point of view, fertilizer is stored energy. You may or may not be able to exchange "money" in any form for stored energy, for "wealth" is either stored energy or the capacity to generate energy sustainably. Everything else is merely a means of exchange. Will gold hold more value as a means of exchange than paper money? If history is any guide, yes—but that's a different "problem" than building or storing wealth. There are many other examples of "problems" whose solutions may well completely fail to address the structural challenges we face. Does your state encourage Solar Energy? The latest Freeing the Grid report from the Network for New Energy Choices rates the states. I live in Georgia, a backward state for energy policy. 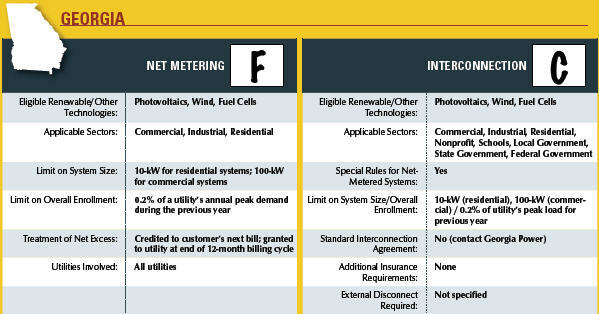 Net metering is a regulatory policy that allows people to sell electricity back to the grid from their own renewable energy facilities, such as a solar array or a wind turbine, incentivizing renewable distributed energy generation projects. The Energy Policy Act of 2005 pushed utilities to adopt net metering as a policy but enforcement and program design has fallen mostly to the patchwork of state utility regulators. Interconnection: Each state regulates the process under which a generator can connect to the distribution grid. These policies seek to keep up the stability of the grid as well as the safety of those who use and maintain it. However, if not implemented properly, these policies may pose a barrier to the development of customer-sited renewable energy and other forms of Distributed Generation (DG). Customers who seek to generate their own electricity—with a photovoltaic (PV) system or wind turbine, for example—and hook up to the grid must first go through this interconnection process. Many customers encounter unworkable interconnection requirements employed by utilities. In some cases, the interconnection process is so lengthy, arduous and/or expensive that it thwarts the development of customer-sited generators—especially in the case of smaller systems. Katie Fehrenbacher at Earth2Tech provides some quotes from the Solar Power 2007 convention on Sep 24, 2007. Ted Turner and venture capitalist Ray Lane spoke about solar energy. Excerpts below. Link: The Mouth Of The South Turner And Kleiner’s Lane Go Solar « Earth2Tech. Not to be outdone (his speech followed Lane’s), Turner called the business opportunity of energy the greatest “in the history of humanity.” “The entire world is going to have to redo its energy regime and solar is going to be a very big part of it,” he said. The most compelling part of the two entrepreneurs’ speeches was their pleas for the industry to move quickly to invest in companies and innovate in clean energy. “We have to move at warp speed to stop using fossil fuels,” said Turner. Lane, channeling Kleiner Perkin’s Eugene Kleiner, said, “Panic, a lot of times, does produce.” And, we might add, earn a lot of returns. Global Warming Hoax (can they be objective with that name?) points out some problems with Al Gore’s movie and slide presentation, according to their set of facts. I wholeheartedly agree with one conclusion from the report — see below. Link: Global Warming Hoax: Facts and Fictions of Al Gore’s "An Inconvenient Truth"
The only way to reduce atmospheric CO2 would be to have solar panels on the roof of every house and building, windmills in every yard and electric cars in every driveway. It is something we will have to do anyway because someday the fossil fuels will run out. Doing these things will not require the political will that Al says people need to have. People will be more than happy to convert because it will save them the ridiculous amounts of money that people spend on home utilities and gasoline. Shane Jordan at Green Options offers some sound advice for reducing energy usage. Excerpts below. Link: How To Get Your Home Ready For Renewable Energy | Green Options. People get so caught up in the image of “free” power from the sun or the wind, that they forget that the cheapest energy is the energy you don’t buy. For every dollar you spend on home efficiency you will take three to five dollars off the cost of your renewable energy system. It is that simple. Use less energy; buy fewer solar panels to supply that energy.. Here is a quick check list of things you should have done before you even think about installing a renewable energy system on your home. In fact, these steps will save you money even if you don’t intend to install a renewable energy system on your home. Lighting and appliances: Make sure you are using the most efficient lighting you can. That most often means compact fluorescent and perhaps LED lighting. Insulation and weather sealing: You want your home to be as sealed as possible against both the cold and the heat. This means weather sealing windows and doors, or even replacing them if you have the money to more insulated ones. … I recommend that you get an energy audit. Many utilities or municipalities offer then for free or for a low fee. Even if you have to pay for one, it is money well-spent. Home owner’s associations and neighbors: Do you live in a historic district? What is your HOA’s policy on wind turbines? Before you spend your money on the solar panels, invest in a little research and neighborly friendliness. Many historic districts were made in the 70’s during the first oil crisis, and many have bylaws dealing with renewable energy prompted by that crisis. Some only apply if your home is visible from the street. Some require a permit. Research is usually a lot cheaper than fines, or having to take down the system. Heating system: Electric heat is not the way to go. That goes for electric water heaters as well. If money was no object, I would suggest you switch to radiant floor solar thermal heating. Not only will the bathroom floor be nice and warm in the middle of winter, but your cats will love it as well. If you can’t go with radiant floor, gas heat is the second best. One thing for sure: you want to have your heating system as efficient as money and resources will allow. Once you have tackled all of these issues, THEN you are ready to call up your handy renewable energy installer and get those super-cool solar panels. Spending a significant amount of money on home efficiency improvements will radically reduce the size (number of solar panels, size of wind turbine etc) and therefore the cost of your renewable energy system. It will also lower your monthly bills, making the payback time on your investment that much quicker. Coal burning power plants and vehicles emit particles that increase the greenhouse effect. Air conditioners need more power to cool homes and businesses as the atmospheric heat increases. Power plants burn more coal and emit more particles. The greenhouse effect increases…. Every summer I ask why we don’t have solar cells on our roofs, producing power for air conditioning and reflecting the sunlight that heats our homes. 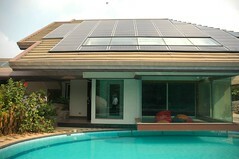 I am told that solar cells don’t look good on a house (perceptions will change). The local power company doesn’t allow connections to its grid (why not?). The return-on-investment of solar cells isn’t viable (maybe next year). Politicians don’t get wined and dined by solar lobbyists (true). And so nothing changes. Our electric bill will be $400 for August. A few more years and it will be $1000 or $1500. We’ll be admiring the homes with solar cells when that day arrives. Below are some excerpts from the Atlanta Journal Constitution newspaper about the heat. Link: POURING IT ON: Heat churns in a vicious cycle | ajc.com. The hotter and stickier it gets, the more we stay inside. The more we’re inside, the more electricity we use blasting the A/C. The more power we consume —- added to the traffic pollution —- the more soot- and smog-forming chemicals we add to the air. And that makes for still lousier air quality and even more reason to stay indoors. We’re fouling our own nest, in effect, and it’s a vicious cycle. WHAT’S CAUSING THE BAD AIR? Weather: Hot temperatures, stagnant air, no rain and little wind has created dome-like atmospheric conditions that keep pollution from leaving. Traffic: Cars and trucks are the main cause of smog and probably the biggest contributor to soot pollution. Power plants: Coal-fired power plants are major contributors to particle pollution, or soot. To a lesser degree they also contribute to ground-level ozone, or smog. Everything else: With the air going nowhere, even backyard barbecues, lawn mowers and weed whackers are adding to pollution saturation. A megawatt measures capacity to produce electricity in an instant of time. Megawatt hours refer to the amount of megawatts used in an hour’s time. One megawatt is enough to power 250 homes or a Publix or Kroger. Forty megawatts would power one SuperWal-Mart or 10,000 homes. Four hundred megawatts is enough to power 10 Super Wal-Marts or 100,000 homes. No hassle solar energy for your home? It seems too good to be true, so I’m going to investigate further. But if it works the way it says, it is a no-brainer. Read the features and benefits statement below. From my research, I have concluded that this is a business model that will succeed if the executive team can overcome a number of conventional obstacles. I HOPE they can succeed because we are currently funding hostile countries and polluting our air and water by using fossil fuels. No upfront investment, no need to become a financial expert to justify your investment. No headaches with the city and the utility; let us handle the engineering, procurement, and construction. Performance-based contract means you only pay for what is delivered. And since the solar power you generate will reduce the need for electricity from your power company, your net payment should always be equal to, or less than, what you’re paying now. Hassle-free operating and maintenance; it’s handled by the experts. Actual hedge against future utility price increases: you can “lock in” your rates for the electricity generated from the solar system at your home for a period of up to twenty-five years, far longer than the guaranteed rates offered by other electricity providers. The Citizenrē Corporation is presently limited in the areas that it can offer the REnU program. Our service territory is defined by the regions that have enacted net-metering legislation. That is because we want to make sure that our customers receive the full benefits of solar power without being penalized by their local utility. As you can see below, even with the limitations, we have a sizeable service territory. It is likely that you are even within our territory and are eligible for the REnU program. However, in the event that you fall just outside of our territory at this time – because it is growing year after year, you can still participate in making clean energy a priority. If you do not find yourself in our service territory, please take a look at our green energy program below. There you will find out how you can help make solar power a significant player in our energy mix.